248 pages | 289 Color Illus. | 11 B/W Illus. Swathes of the human world are covered in ornamental grass lawns; they are the single most commonly encountered horticultural feature on the planet. Unfortunately, they are now often viewed as resource-draining green deserts due to the lack of plant and animal diversity, the need for frequent mowing and watering, and addition of lawn greening products to keep them looking at their best. It is a venerable horticultural feature that is essentially frozen in time, and with few alternatives to whet the appetite, the lawn has languished in its current grass-only format for decades. Until now. Tapestry lawns are a new, practically researched and timely development of the ornamental lawn format that integrates both horticultural practice and ecological science and re-determines the potential of a lawn. Mown barely a handful of times a year and with no need for fertilisers or scarifying, tapestry lawns are substantially richer in their diversity of plant and animal life compared to traditional grass-only lawns and see the return of flowers and colour to a format from which they are usually purposefully excluded. 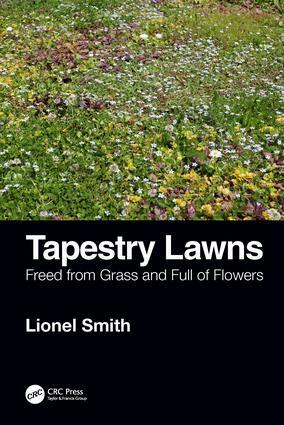 Tapestry Lawns: Freed from Grass and Full of Flowers traces the changes in the lawn format from its origins to the modern day and offers information on how and why the tapestry lawn construct is now achievable. It provides guidance on how to create and maintain a tapestry lawn of your own and champions the potential benefits for wildlife that can follow. If you have ever thought about mowing your lawn much less, making it much more colourful and wildlife friendly, then this book will inform and guide you to create a perfect, grass-free lawn. Dr Lionel Smith received his PhD in Biological Sciences from the University of Reading in 2014. He is currently Lecturer in Horticulture at Myerscough College, Lancashire, and lives in St. Anne’s-on-Sea.